Circuit abdominal workouts are a great way to increase the intensity of your ab routine. By doing many different ab exercises in a row, you can work your ab muscles from all angles and get a really good burn in your stomach. If you read the page with 6 straight set workouts, you know that the straight set technique focuses on one exercise at a time before moving on to the next one. Circuits are generally harder and more intense than supersets because you would do 3 or more exercises in a row without rest if you use the circuit technique. A circuit is simply a list of 3 or more exercises that you do in a row without resting. The circuit technique can help to keep your heart rate elevated, which increases the aerobic and endurance benefit and burns calories and fat. Below are 6 abdominal exercises that don't require any equipment, so you can do them at home or at the gym. If you are a beginner, just do the first 3. If you have been working out for awhile, do the first 4.If you feel like you're in good shape, do the first 5 or all 6 exercises. Of course if you're a beginner and you're feeling adventurous you can attempt to finish the entire circuit. In a circuit you move from one abdominal exercise to the next without resting. Once you get to the end of the circuit rest for 30-90 seconds, and then repeat the circuit. Aim to complete the circuit 2-3 times. Perform 10-25 repetitions per exercise. Move in a rhythmic and controlled manner during all exercises. You can click on the picture to get more instructions or information about the exercise. Abdominal Exercise #1 is Ab Crunches. The circuit begins with basic floor crunches. Remember to lift your shoulder blades off the floor, pause briefly at the top and slowly lower back towards the floor. Abdominal Exercise #2 is Leg Raises. After finishing 10-20 repeitions of crunches, move right into leg raises. Keep your back supported throughout the exercise. If you feel your back arching, don't lower as low to the ground, rest, or move to the next exercise. Abdominal Exercise #3 is Bicycle Crunches. After leg raises move right into the bicycle crunches. Use your hands only for support. Count each time you touch your right elbow to your left knee as 1 repetition. Complete 10-25 repetitions. Abdominal Exercise #4 is the Seated Russian Twist. If you abs are completelt dead after the first 3 exercises, you can rest and just go back to the beginning of the circuit. If you're feeling good after the bicycle crunches, keep going. Count each time you turn to the right as 1 repetition. Abdominal Exercise #5 is the Plank. The plank is an isometric exercise for your core muscles. Simple balance on your elbow and toes, and hold that position for 30-60 seconds. Don't worry if you start shaking, just make sure to keep your back in good alignment. Abdominal Exercise #6 is Oblique Floor Crunches. 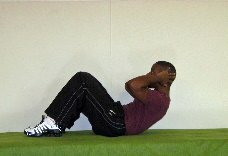 The last exercise in the circuit is twisting crunches for the obliques. Use your hand only for light support and lift your shoulder off the floor as you curl up towards your knee. Perform 10-25 repetitions on each side. Circuit Abdominal Workouts can really challenge your abdominal muscles. Listen to your body. Stop if you feel any discomfort, and remember to stretch your hips and lower back after your workout. Master the first 3 exercises, then the first 4, then the first 5, and eventually all 6. 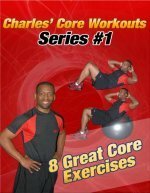 Have fun with the circuit abdominal workouts!